Gaur Yamuna City - Gaurson's has launched new project Gaur Yamuna City on Yamuna Expressway. This gated project will have over 20,000 units comprising of 2BHK, 3BHK & 4BHK homes with sizes ranging from 855 sq. ft. to 1,950 sq. ft. It also offers plots within the township with the size range from 91 sq. mt. to 221 sq. mt. The township is strategically located on one of the fastest-growing professional hubs of India and is just opposite to the Buddha International Circuit (BIC). 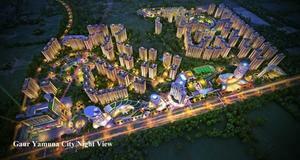 Also located nearby is Sports City – India’s only integrated sports city being situated on the Yamuna Expressway. The site is well connected to the heart of Greater Noida, Noida and Delhi. Sizes: 855 sq.ft. – 1950sq.ft..
• 250 acres of land. • Area ranging from 1000 sq.ft. to 1375 sq.ft. • Olympic-size indoor swimming pool, football field, cycle tracks, badminton, squash, tennis, basketball courts, Yoga / aerobics hall and a large skating rink. • The township will also have venues for celebrations like Marriages, large Gathering / Get together , Sports events and festival celebrations. Availability of Two Amphitheaters various banquet halls and party lawns are spread all over the township . • Location near and opposite Formula 1 track . • Night Safari in proximity. • Operational NIIT campus nearby. • City with all amenities. • Near Jaypee sport city. • Distance from important landmarks F1 Buddh International Circut 5 mins Gautam Buddha University 12 mins Pari Chowk 15 mins Sector 18, Noida 20 mins Kalindi Kunj 25 mins South Delhi 30 mins. Term and condition as applicable, the prices are subject to revision and unit availability.